Horizon Tech's new flagship beast - Flax and Wood Pulp Coils! 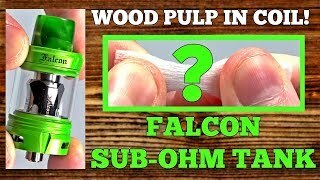 Triple bottom airflow - new coil design with wood pulp - microporous material for faster saturation - this new sub-ohm by HorizonTech is truly on the cutting edge for pushing the boundaries on vaping technology. The .2ohm coils are recommended for 80watts or less. While it may not have any wings, the Horizontech Falcon sub-ohm tank sure does give you a great view of the clouds. Vape clouds that is. Toting a massive 25mm diameter and a 5ml e-liquid capacity that's sure to keep you vaping on for hours on end this surprisingly small of a tank throws bigger punches than what's normally seen in its size class. It's probably one of the most versatile tanks available thanks to its large coil head selection. Let's take a closer look at the nitty-gritty of this spritely performer down below and determine if it really does live up to the hype. Aside from the relatively short height of this tank coupled with the wide barrel design, the Horizontech Falcon looks to be a very unassuming little tank. There's some minimal branding towards the top of the tank but that's pretty much it. The coil heads do feature an interesting geometric shape that's sure to catch the eye especially when it's swimming in a tankful of yummy e-liquid. Quality-wise it's hard to find any reason to complain. The Horizontech Falcon is built out of high-quality stainless steel along with glass forming the tanks reservoir. The kit includes an 11mm bore 510 Delrin drip tip, as well as a fancy looking 8mm, bore 510 resin drip tip. Something not commonly seen in other atomizers is the gold plated 510 pin which definitely helps in forming a foolproof connection between the tank and your mod of choice so you're very unlikely to experience any abnormalities when it comes to reading your coils resistance or actual firing of the mod. The stainless steel is machine quite well, especially so on the threads used for the top cap, facilitating a smooth threading experience when twisting the top cap to refill the tank. No snags or crunchy threads there, no siree. Another factor to consider is that the kit comes with two glass tanks with their own respective e-liquid capacities. A straight and slender 5ml chamber and a beefy bubble tank that holds up to a whopping 7ml of e-liquid. Each Horizontech Falcon kit comes with a bountiful 4 coils: The F1, F2, and F3 parallel coils are all rated at 0.2 ohms each with their own wicking material. The F1 uses 70% organic cotton and 30% wood pulp as a wick, while the F2 has a unique flax fiber wick while the F3 uses a combination of flax fiber and paper. The M1 Falcon coil stands apart from the pack with its mesh coil design rated at 0.15 ohms wicked with organic cotton. While coils F1 to F3 perform similarly in terms of flavor quality and cloud production, the difference lies within the wicking speed. The F2 and F3 coil heads work best for the heavy cloud chucker that loves to blow clouds all day while guzzling e-liquid at a rapid pace. The flax fibers used wick exceptionally quick and do their job perfectly which is to avoid any nasty dry hits. Last but definitely not the least, the M1 coil offers the most cloud production amongst all 4 but takes a slight hit when it comes to vapor density. The airflow design on the Horizontech Falcon isn't revolutionary by any means, but that doesn't mean its bad by any means, in fact, it's pretty great. Zero turbulence and whistling regardless of how tight or lose you set your airflow is always a great indicator of a properly designed airflow and the HorizonTech Falcon has that in spades. 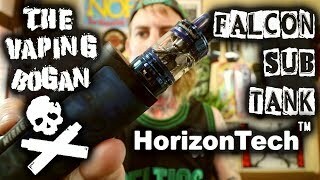 While the Horizontech Falcon might not bask underneath the glory of big name brands such as Smok or Eleaf, it definitely deserves a shot at the limelight especially given its solid performance throughout the board. The extensive selection of high-performance coil heads that come with the kit should be reason enough to pick it up. And if that's not enough, the excellent airflow design easily competes with many of the more well-known flagship tanks out there.